I need to make this my mantra for the next few days! We are in the middle of another snow event here in Ohio!!! My friends and I were driving to Columbus today to meet some other gals for lunch ~ scratch that trip! We were in Florida a couple of weeks ago ~ and one morning, this greeted us on the beach! 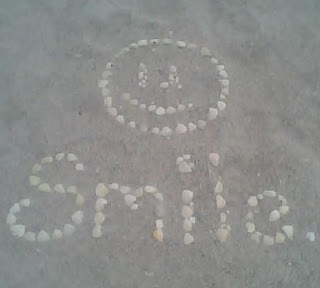 Made out of shells and undisturbed by the surf ~ I love it! Wish I had taken my camera ~ I think the picture would have been better but Sonny's cell phone at least let me capture the essence of somebody's kind thoughts that morning! 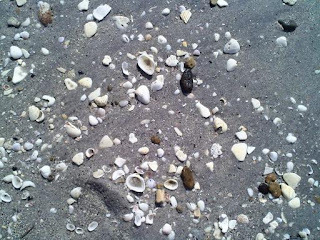 This scattering of shells was taken with my cell phone (we drug the camera all the way to Florida and didn't take one picture with it!) ~ I just liked the random look of shells and stones that washed up on the beach. We had great fun with our friends, Diane and Greg ~ they go to Florida for a couple of months and kindly invited us to spend a week with them! The weather was not too warm but we went to the beach four times ~ Sonny loves to hunt shark teeth and he found quite a nice stash ~ some for us ~ and each little grandchild gets some for their collection! A couple of those days the wind blew so hard that Diane and I covered up with hooded jackets and beach towels on our legs ~ there was free microdermabrasion on the beach that day!!!! We laughed because we looked like little old ladies all covered up for our day at the beach! We ate some great food ~ Diane and Greg know all the best places! We had dinner one evening with our son-in-law's parents at their clubhouse ~ that was really good ~ but they plied me with cosmos before we left so I hope I behaved!! We met another couple from Lake Erie for lunch a couple of times ~ there is always someone we know down there! We're getting the bug! We may go for a couple of weeks next year ~ it was nice to get away for sure ~ although there were two big snow storms here while we were gone ~ a little unnerving with Tad and his sitter here ~ Sonny's boys came and plowed the drive twice so Barb wouldn't be trapped like a rat!! When we arrived at the airport in Columbus, our car was buried under a foot of snow and it was COLD! After Sonny cleared it off, we drove to a nearby McD's and let it warm up while we went inside and warmed up! But it was all worth it to spend time with our friends!! Soon, Spring will be here and we'll all be back at our beloved lake havens having the time of our lives!! One trip we took while in the sunny south, was to visit the Ringling Museum in Sarasota! A museum of a miniature circus ~ very interesting and intricate. A tour of the family mansion on Sarasota bay ~ hard to believe people call a place like that 'home' ~ everything so lavish and so ornate and gilded with gold!!! And a wonderful art museum filled with paintings of Rembrandt and Matisse and lots of painters I never heard of. It was really inspiring to be standing in the middle of all of those beautiful paintings. If you're in that area, it's really something you should visit ~ a wonderful experience! Last week was a fun week here in the gravel pit (that's what this property was years ago!) ~ the transmission went out in Sonny's truck ~ thank goodness for a wonderful friend who loaned him a truck for a week! I lost part of a filling in a tooth and am scheduled next week to have that repaired! Yesterday, I lost part of a filled TOOTH on the other side of my head and had to go in for an emergency visit! I opted for the $183 filling as opposed to the $1100 crown and pin; as opposed to the $2000 root canal, post and crown ~ those were my three choices and I took the least expensive and time consuming route. Maybe not the smartest choice but I'm choosing to believe that this filling will hold and serve me for as long as I need it! Going to the dentist is so traumatic for me ~ I try to meditate while I'm in the chair so they don't think I'm the biggest baby they've ever had! Since today's plans were changed, I have ample time to clear up my office work, do laundry and maybe get some hooking time in! I'll show you my rabbit rug on my next post! I hope all of you are somewhere warm and cozy ~ hasn't this been the craziest winter?! Came to call on Monday ~ no school ~ she wanted to hang out with her "Bobo". We made some nice cinnamon muffins and got out the tea pots and frozen fruit (Luci loves frozen fruit that I keep for smoothies!). We had a fun day. One evening this week, Luke and Luci were here and Sonny's daughter and boys ~ we had them all for supper ~ I've about outdone myself in the kitchen this week!!! This is how much snow is on our deck from the snowstorms last week! It is just hard to believe how much snow fell out of the sky!!!! A lot of this happened while we were on our Florida trip ~ kind of unnerving to be gone and have Tad and the sitter home in a blizzard ~ but Sonny's boys came and plowed and shoveled the walk for us! That was a comfort ~ I didn't want Barb to feel trapped like a rat back in this winter wonderland! And this is today ~ this flowering (not now of course) crab apple was home to a half dozen really fat robins today! I didn't grab the camera in time to get a photo of all of them but what a feast they were having ~ frozen crab apples! The sun was shining brightly today ~ it made the 34 degree temp seem so much warmer! It's been a busy week ~ we have had an empty rental ~ finally got that rented today ~ such a relief! I've had rug hookers in and out this week and a new gal coming tomorrow! And someone coming to look at our antique log cabin that's for sale! 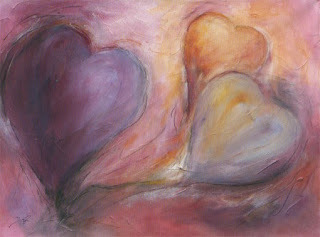 So a lot going on here ~ I haven't hooked for a long time ~ am anxious to get back to that! Hooked by me but DESIGNED by granddaughter, Hannah ~ when she was six years old! She brought this to me two Christmases ago with a nice written story to go with it and finally, just before the holidays, I got it hooked so it would be finished for her to see when she arrived! Instead of buttons, I used three rusty bells for embellishment. I love these little primitive children's drawings and have been saving the kids artwork to make small patterns. Hannah's Snowman and Haylee's Painted Fish (the one Hannah hooked at Christmas) will be available on monk's cloth and linen. The Snowman as shown is 9" x 12". This corded finish looks nice on a small mat. I tore the wool strip about 2 1/4" wide ~ folded the wool over the cotton cord and machine stitch. Hand tack the cording to the edge of the finished hooked piece, starting at the center bottom of the rug, working your way around the mat. Turn the piece over, fold over the raw edge of the wool cording and blind stitch to the foundation fabric for a nice finish!! At the bottom, overlap the two edges so the cut ends don't show! It's a little tedious to do this kind of finish but the results are worth it! I did a quick label of fabric you can run through the printer and then iron it on ~ worked great for me to get those little rugs sent out to the grandkids! If not pressed for time, I would iron it to a piece of wool and hand stitch that to the rug ~ next time! Last but not least, is Miss Luci and my youngest son, Ted, at the father/daughter dance at our local dance academy. Moms and grandparents could come and take pictures before the dinner ~ I always feel blessed to be asked! There were costumed doormen, pages, a fairy godmother, ladies in waiting ~ a real Cinderella ball! They had a sit down dinner and as we left, Luci was eating chocolate pudding ~ I hope it didn't get on her pretty dress! As soon as I post this, I must get on to the next important task at hand!!! PACKING!!!!! We're leaving for FLORIDA in the morning ~ yay!!!!!!!!!!! Our wonderful lake friends, Diane and Greg, invited us to come for a week and we are sooo grateful to be heading to some warmth and some sun!! I have clothes spread all over the bedroom ~ suitcases thrown open ~ and it'll be like a white tornado up there in the next few minutes!! I have to pick up some groceries for Tad and his sitter (thank goodness for Barb!) and get my nails done and then we head for Columbus tonite. Sonny always thinks he has a better shot at getting me on the plane on time, if he has me at the airport the night before! So, I won't be posting all week but will have stories to tell when we return!! Stay tuned! And stay warm! !